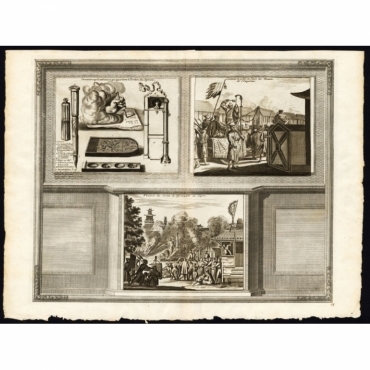 In this category you can find any antique print that does not fit one of the other categories. 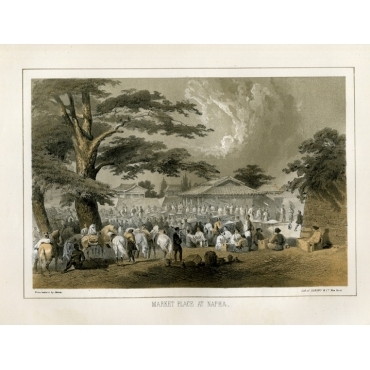 We offer a wide range of authentic antique prints for any budget. Explore our collection by selecting a specific category or use the search bar. While we hope you enjoy our online catalogue, we are always available to provide customer service. If you need help finding a particular product or if you have any other questions, please feel free to contact us. In deze categorie vindt u antieke prenten die niet onder te brengen zijn in de andere categorieën. Bij Bartele Gallery vindt u antieke prenten voor ieder budget. U kunt onze collectie eenvoudig ontdekken door gebruik te maken van de zoekbalk of de categorieën. Terwijl u op zoek bent naar de een antieke prent, zijn wij altijd beschikbaar om uw vragen te beantwoorden of voor u te zoeken naar de perfecte antieke prent. Aarzel dan ook niet om contact met ons op te nemen. 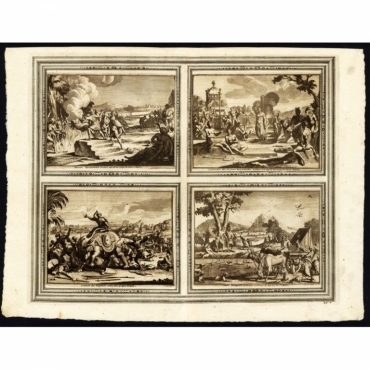 Antique Prints | Other There are 166 products. Plate: 'Verhael des Schipbreuks van 't schip Weesp.' 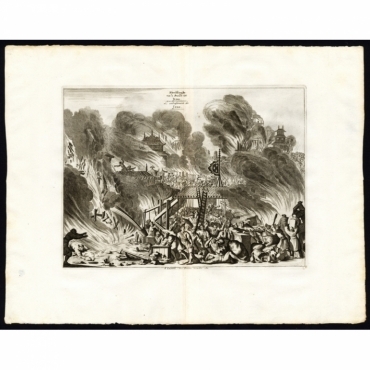 (Story of the shipwreck of the VOC ship called Weesp.) 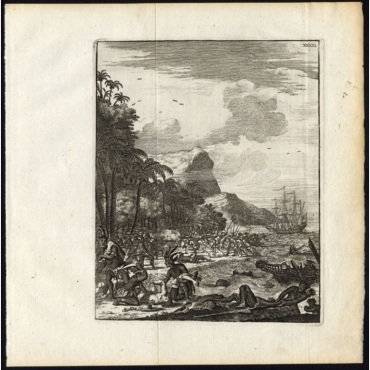 Many Dutch were killed by the cruel canibals on the Nicobar Islands, India in October 1662. In the background a VOC ship. 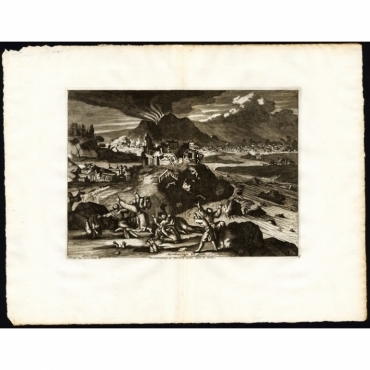 Plate 9: 'Afbeeldinghe van de Brandt tot Jedo. / L'embrasement de Jedo.' (The fire in Edo / Tokyo, Japan.) View of a big fire, probably the Meireki fire of 1657. Extremely rare in this edition. Plate 8: 'Aertbeevinge tot Iedo. / Tremblement de Terre a Jedo dans la Chine.' (Earthquake in Edo / Tokyo, Japan.) View of an earthquake, which causes a vulcano eruption and tsunami flooding. Extremely rare in this edition. Plate 44: 'On voit ici represente tout ce qui appatient a l'ecriture des Japonais. - Comment on publie au Japon les Patentes de l'Empereur. - Punition du crime de lese-majeste au Japon.' Extremely rare in this edition. 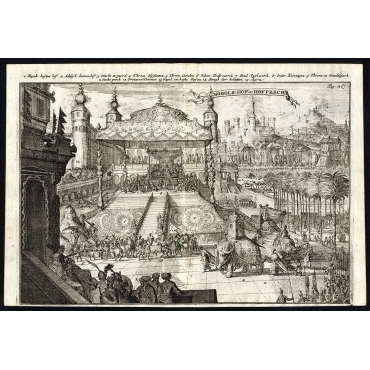 Plate I p.120: (A party in Batavia / Djakarta on Java, Indonesia.). 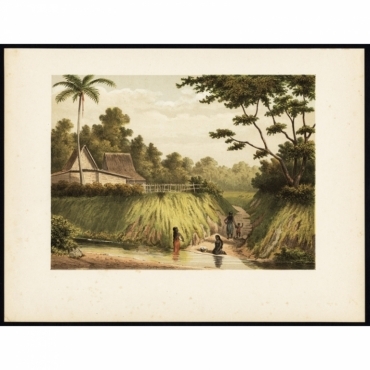 Plate Ib p.60: (Women do the laundry in the mountain river near Tjiliwoeng Valley, Buitenzorg, Batavia, Java, Indonesia). 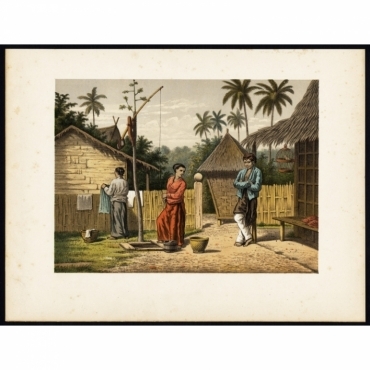 Plate Ib p.82: (Domestic scene with locals on Kampong Babakan Madang on Java, Indonesia). 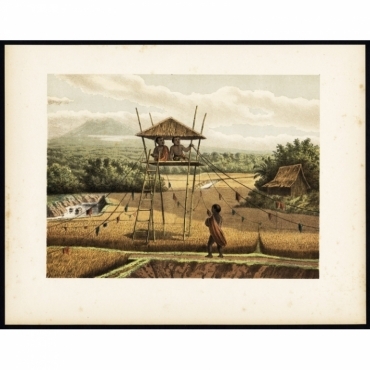 Plate II p.142: (Children chasing away of birds in rice fields near Tempoeran on Java, Indonesia). 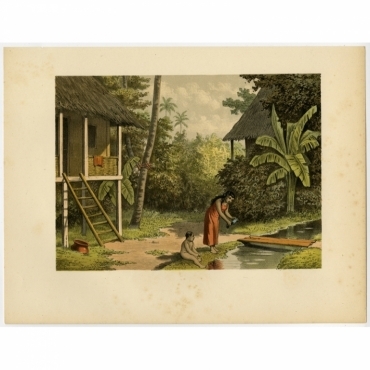 Plate IIb p.96: (House in Oleh-Leh, on Atjeh, Sumatra, Indonesia). Plate: 'Konst Vyeren.' (Artificial fire / Fireworks.) On this plate: 1. Triple fire tromp. 2. Chan's guards. 3. Fireworks on the outer court. 4. Painted banners with fireworks on spears. 5. Fire lancers. 6. Castles and radars with fireworks. 7. Houses of the Chan and his nobility. 8. Aireal fireworks and skyrockets / dragons. Very rare. 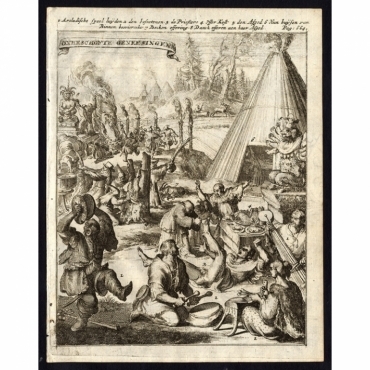 Plate: 'Japanse Koophandel.' (Japanese Trade.) In this scene: 1. The rudder af a ship. 2. Its artillery / bullets. 3. Barreled bibles. 4. Crane. 5. Labourers. 6. Dutch merchants. 7. Nagasaki trade place. 8. Announcer. 9. Hen with chicks Islands. 10. Dutch VOC ships. Rare item. 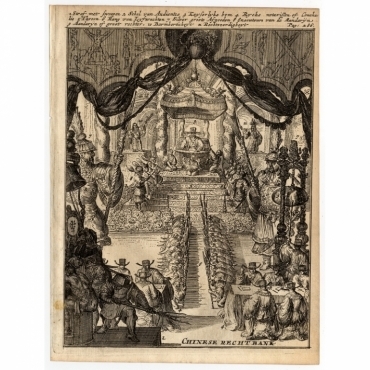 Plate: 'Onbeschofte genesingen.' (Savage healings.) On this plate: 1. Arcadain music players. 2. The be-witched / sick. 3. Priests. 4. Offer / sacrifice meal. 5. Deity. 6. Houses / tent incense spreading. 7. Sacrifice of goats. 8. Thanks sacrifice / offering. Very rare. 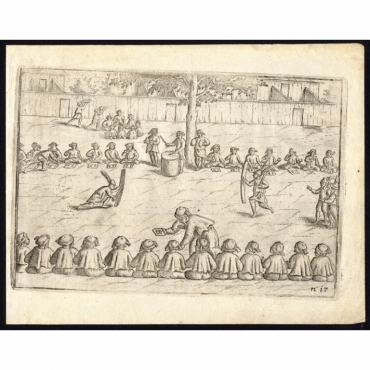 Plate: 'Mogols Geboortevyering.' (Mogul's birthday celebration.) The court of the Great Mogul / Mughal at Agra, India, during the Mogul rule from 1524 to 1752.) Agra / Akbarabad is a city on the banks of the river Yamuna in the northern state of Uttar Pradesh, India. On the left view the splendour of the court with ceremonies, audiences, palaces, etc. 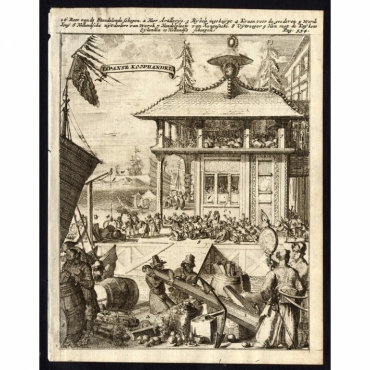 Plate: 'Chinese Rechtbank.' (Chinese court.) In this scene: 1. Punishment with wip / lashing. 2. Court bell. 3. Imperial gong. 4. Imperial notaries or Conchalis. 5. Throne. 6. Line-up of body guards. 7. Silver giant deities, 8. Mandarin executioners. 9. Madarin or upper judge. 10 Statue of mercy. 11. Statue of justice. Rare item. 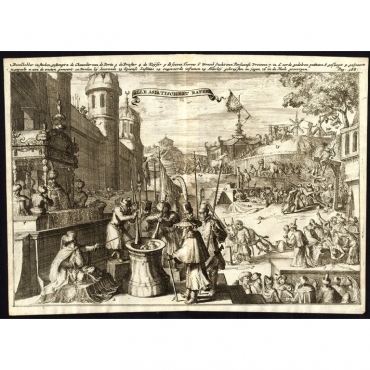 Plate 17: 'Afteeckeninge van hare gastmalen.' 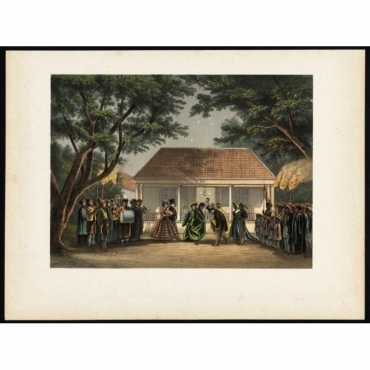 (Depiction of a guest meal on the Banda Islands, Indonesia) Also depicted:entertaining fights. Rare.